Notes: Would you just look at those fresh faced kids on the cover, it was a different world back then. 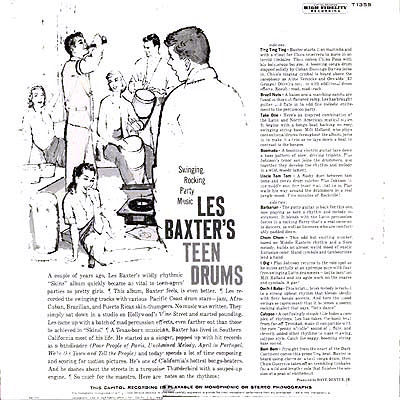 Les recorded this record as a follow up to his successful "Skins" release a few years earlier. 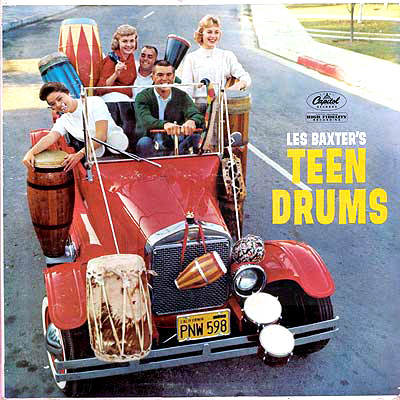 The cover states that none of the music was written down, they went into the studio, started knocking around on various percussion, played some sax and a record was born. This is a swinging set of Afro-Cuban, Brazilian and Puerto Rican thumpers and will grab any room full of party goers and have them up and dancing the night away (as you can see by the back cover illustration). And lucky for us, the cover also tells us, "This microphonic microgroove recording cannot become obsolete". Man, one listen could've told me that!